We’re proud to announce an initiative Roundabout has launched to help our audiences, colleagues and fans register their support for the National Endowment for the Arts. For organizations throughout our city neighborhoods and across the U.S., the NEA provides not only crucial financial support but the endorsement and encouragement of a nation that believes in its culture. That is the country in which we are proud to create the theatre, the education programs and the inspiration we create. 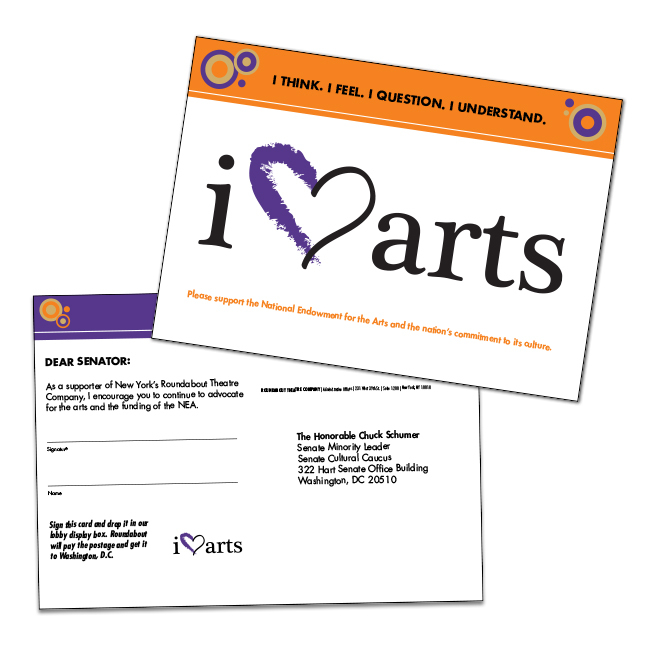 In our theatres, attendees will find a pre-addressed postcard in their Playbills. All they have to do is sign them and drop them in the display drop-boxes in the theaters’ lobbies, and Roundabout will stamp and mail them to Senator Chuck Schumer on their behalf, encouraging him to continue his advocacy for the NEA. As an organization that provides a place for artists to act and express themselves, we’re pleased to be able to provide the same opportunity to our audiences. For arts projects and education programs significantly smaller than Roundabout, the NEA is a literal lifeline. As an organization with the benefit of an array of resources, we’re pleased to use the volume of our voice to help initiate a chorus across the country. Please join us. ﻿Use our Facebook frame to show your support on social media. Activate this initiative in your community. Here's everything you need. We encourage those who support the cause to create their own postcards and other materials. With visual consistency throughout the effort, our campaign can be even greater than the sum of its parts.